Trilogy Golf Club at Vistancia, located 25 minutes northwest of Phoenix in Peoria, is a golf trip worth experiencing. 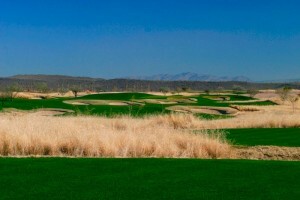 Trilogy draws upon Arizona’s distinctive desert landscape and is surrounded by thick native grasses. The course provides golfers with a serene round outside the crowded Phoenix and Scottsdale markets. With new exits off of the 101, 17, and 303 freeways, you can make a trip from Scottsdale in 40 minutes and pay half the price. Unlike most courses, Trilogy wants a player to get the best golf experience at the best rate. They offer a unique EARLY REWARD program, which offers incentives for booking earlier tee times rather than having to settle for the more affordable afternoon rates. Trilogy Golf Club at Vistancia recently received Golf Digest’s highest ranking for public courses, 5 out of 5 stars. It is the only golf course in Arizona given this recognition and shares the title with only 24 other courses nationwide including Pebble Beach, TPC Sawgrass and Spyglass Hill. Renowned architect Gary Panks constructed the nine-year-old facility back in 2004. His goal was to build a championship-style facility that remains playable with all skill levels. Trilogy offers five different tee boxes ranging from 5,573 yards to 7,259 yards. Panks’ goal was to create a design which “everything you see is what you get.” Majority of the fairways are straight and open with large greens. But that does not mean it is easy. Trilogy features more than 70 pronounced and transitional bunkers that line the fairways and surround the greens. The course opens with a great par-4 that is a tease for the rest of the round. The wide-open fairway bends slightly to the left with bunkers lining the inside turn and native grass on the right. The medium size green is slightly elevated with a bunker short right and water in the back. However, don’t be afraid for the backside of the green because it slopes from back to front. Number two introduces the first of four par-3s on the course, which I personally think are some of the toughest holes. The 203-yard number two has a large green, but is heavily surrounded by hazards. There is a bunker that guards the front right, a bunker that lines the entire left side of the green, and a large water hazard on the left as well. But that’s not all. There are trees in the back of the green. This hole requires precision, but if mishit, hope for a straight and short shot. The third hole does not look too daunting from the tee box, but actually holds the title for the most difficult hole on the course. Number three is a short par-4, dogleg left with a large wash area shy of 150 yards from the green. The best shot is to land your tee shot by the 150-yard marker. From there, go for the center of the green, as bunkers protect the front and back. Hole five is the first signature 608-yard, par-five that is a true 3-shot hole. 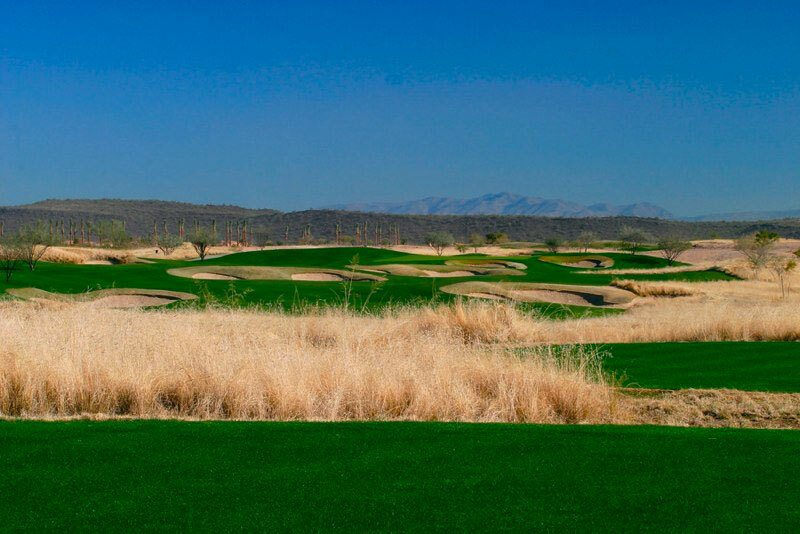 This hole meanders through the desert terrain and requires strategic plays. Off the tee, avoid the large fairway bunker on the left. The second shot should cross over to the left side of the fairway in order to avoid the deep bunker on the right. Here, there is about 120 yards left with two bunkers guarding the left side of the green. Don’t aim too far right otherwise your ball will roll off the green into some grass basins. The finishing hole on the front provides the perfect opportunity to make up a shot. The 509-yard, par-5 looks similar to the challenging number three; however, the fairway gives room for a longer tee shot. Aiming for the right center of the fairway will give the best approach shot in or lay up. Like most of the other holes bunkers surround this green. The back nine opens with one of the best tee shots on the course. The tee box is elevated and looks down on a left side bunker and tall native grass on the right. If you hit down the middle, the approach shot will be a mid to long iron into a deep green protected by two right-side bunkers. Look out for the hidden bunker on the back of the green. The second signature hole, number 14, is a lengthy 564-yard par 5. There’s a large landing area from the tee box, so it is best to give it all you have. For long hitters, it is possible to go for the green in two, but lying up is not a bad play. The third shot will leave about a 100-yard approach shot in. Water wraps around the back right of the green, so it is better to be short than long. Number 15, also what I like to call “bunker city,” is one of the best holes on the course. The par-4, 348-yard hole is lined with seven bunkers on a tiered fairway. There are several options to play this hole, but the shortest and easiest angle into the green is hugging the left side of the fairway. If played correctly, avoiding the sand, this hole sets up a birdie opportunity. The home stretch in is a great finishing hole testing driving accuracy. A creek runs down the right side of the fairway with the fairway sloping toward the water. Stay on the higher left side. The best play is to lie up short of the bunkers on the left. This will give you a large landing area for your second shot. Four greenside bunkers protect the green with water long of the hole, so make sure you accurately judge your distance. Trilogy Golf Club at Vistancia is a 5-star rated course for the right reasons. The course has great customer service at its restaurant and friendly professional staff in the pro shop, baggage drop, and on the course. Trilogy is held to the highest standards with perfectly groomed fairways and greens and terrific practice areas. If you are looking for a top-notch destination to play on your Arizona Golf Vacation, check out Trilogy. 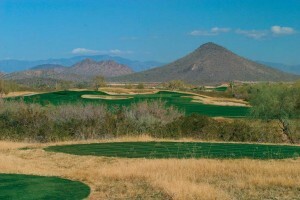 The course is a design unique to Arizona. It’s rolling terrain, bunkers, and native grass provides variety and will certainly make for an exciting round. And the best part is; Trilogy offers half rate prices compared to Scottsdale course, so you can come and enjoy one of the Midwest’s best facilities. Trilogy at Vistancia in Peoria, AZ has a gorgeous golf course. This 55+ community is also a great place to live. Their community amenities are some of the nicest I have seen.